I get to leave my desk job this beautiful Friday in September and help out on a delivery to Texas. When I have the truck ready, I leave for the next town to the shipper. I get over 42,000 pounds of spices. Next stop is the Pilot to weigh the load. When you pull onto the scale, you can see that it is in sections. Each axle gets one of them. The sections are big enough to handle most loads and different type of trailers. I get this done and all axles are where they should be so I shut off the truck so I can hear the speaker. I also have to get out and stand on the top step and reach for the speaker button. I press it and soon a voice asks, "First weigh?" I tell them yes. They need to know this as you may have just weighed and found out you needed to slide your tandems and weigh it again for $1. I also give them my truck and trailer number. Then the voice says I can pull off the scale and come inside. I pull through the fuel island and park. At the fuel counter I ask for my scale ticket, and I pay $8.50 for it. I turn this expense in on my taxes even though my employer will pay for it. I want the extra deductions. The CAT Scale Collector Card is one that I already have 3 of, but I'll still keep it. I can still use it. The scale ticket shows my steers are 11,920, the drives are 31,480 and the trailer is 31,480. 74,880 total weight. All legal, and best of all, no sliding of tandems. I hate having to slide the tandems because I always get a trailer that came over on the Mayflower and it takes 2 people to help slide those wheels. Now I know how much fuel to buy, but this is not one of our fuel stops. The nearest one is Webbers Falls, Oklahoma at the Love's Travel Plaza, so I head there with my Bee Gee's keeping me happy. When they're done, I'll put in some Johnny Cash. When I arrive at the Love's, I park for the night. I'll get my fuel in the morning. Enter truck number. I do, and press enter. Enter mileage. I do, and press enter. Fuel for tractor, reefer or both. I press tractor. Do you need cash advance, yes or no. I press NO. Do you wish to purchase oil, yes or no. I press NO. Thank you. You may begin fueling now. When I'm done, I pull ahead and go back inside. I didn't fill it up because I don't know what my next load will be. I wanted the fuel level to be near 1/2 full for my comfort when I reach Texas. I get a cup of coffee and head to the fuel counter. The same clerk is still there and she does indeed let me have the coffee for free. That's a nice thing to do and I thank her for it. Now its time to roll. I drive in some ground fog in places for about an hour till the sun rises. The highway I'm on is very pretty, and I sure enjoy the view. When I came to Mount Pleasant I wasn't thinking and I took the business route into town instead of the bypass. What a mistake that was! What a boo-boo! I know better than that and now I am pissed at myself. 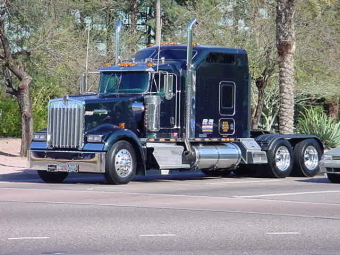 With this longer wheelbase Kenworth and those tight turns downtown and one way streets, "cruising" the town square was not fun! I needed every inch of road to make the turns. OK, I made it through one turn with no vehicles parked near the turn on either side but the next turn I could see was going to be a problem. I've got one block to decide what to do. This turn has 2 left turn lanes and now I'm faced with traffic on my left which will be in my way. While the light is red, I look ahead to the next block and debate turning there instead, but it looked like a worse situation than this one. Do I sit here and call the police for assistance? Will I get a ticket?OK, now my light is green and glory be!!!! No one is on my left!!!! One problem is gone and I pull ahead as far as I could and my next issue is the pickup parked next to the curb. I am just barely moving as I roll forward and then crank it hard left. I still have no one on my left so that's a blessing. I missed the pickup by inches and the left trailer wheels are about 6 inches from the curb. Good thing these are one way streets! I cussed myself all day for allowing this to happen. I made it to the reciever on the south side of town. I wasn't there very long and I soon I was headed to Dallas. I'm going to pass by the reciever I went to for a year when I was doing the Dallas runs. I Even thought about stopping in just to say HELLO, but I drove on by instead to my destination. At my shipper/reciever, I drop this trailer, and then get my loaded one going to Chicago, but I won't be taking it there myself. Traffic is awful in Dallas/ Fort Worth. My oldies staion is saying it's due to accidents. My nerves are not used to this. The 40 miles to Anna was bumper to bumper traffic and with lots of stupidity. I forced myself into the left lanes where it's safer and faster. I stopped at Anna. I couldn't take this anymore. I was stressed out. It's time to take a break so I can relax and be safer when I head back out. I weighed the load and had a sit down meal. When I got back on the road, there was some traffic problems but now I was ready for it. I went about 1 hour into Oklahoma and shut it down for the night. I left at 5 am and stopped for fuel. The gauge was getting near the warning area. I asked the clerk about a fellow clerk who I saw weekly when I did all those Dallas runs. I'm told she is working at another station and will be given my message. I take the turnpike home where the speed is 75 and as I enter the highway on a slight upgrade it took me 2 1/2 miles to reach 75 mph with this heavy load. I cruise along listening to my Bee Gee's and Johnny Cash. I arrive to our lot at 10:00 and drove 829 miles. 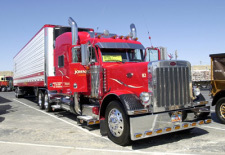 A network of over 1,500 certified truck scales across the U.S. and Canada found primarily at truck stops. CAT scales are by far the most trustworthy scales out there. After learning I would be headed out on the road with my husband it was time to see our assigned truck for the first time and start loading in our goodies.